1. We don't have to default - unless you count a lot of important stuff. The U.S. government has more than enough tax revenue to make all of its interest payments on Treasuries. So we won't "default" in that sense. But there are all the other government obligations that we won't have enough money for. 2. Those other obligations include Social Security, Medicare and military pay. Good luck "prioritizing" what to pay -- and what to skip. 3. Government spending cuts would be severe. If we don't raise the debt ceiling, spending would drop by about a third very quickly, and the resulting recession and stock market crash would be devastating. 4. The debt ceiling is about paying for past spending decisions. Political negotiations should focus on future spending decisions. 5. Oct. 17 is not "default day," and missed payments wouldn't happen until a few days later. Rather, Oct. 17 is the day Treasury Secretary Jack Lew thinks he'll be out of tricks -- he will still have about $30 billion in cash and incoming tax revenue. 6. Politicians and the media don't do well with squishy deadlines. Our countdown clocks are probably wrong. And politicians will feel emboldened if nothing bad happens when the clock strikes midnight on what may turn out to be the wrong day. 7. Government tends to do whatever it wants in a crisis. That means if it really came to it, I bet we'd just pay everything anyway. Remember the way the Fed abruptly decided that Goldman Sachs and Morgan Stanley were bank holding companies so it could lend them money. 8. 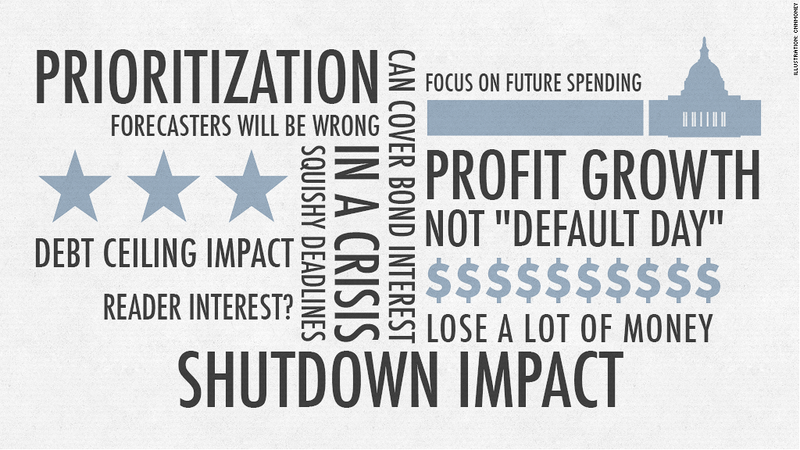 The shutdown is a different issue and not as big a risk to the economy as the debt ceiling. But beneath the surface, people are starting to feel the shutdown's impact, especially small businesses, furloughed workers in the private sector and military families. And a few thousand preschoolers staying home. 9. Before too long, everything will go back to normal and we'll start talking about slowing corporate profits and when the Fed will start to taper. But we still won't be having the meaningful debate we need to have about the long-term debt. 10. Forecasters will be wrong: Financial markets won't behave like the consensus expects them to. 11. But there will be one investment guru who calls it exactly right and becomes a star. And he or she will lose a lot of money next year. 12. Stories about Apple will always get more page views than stories about dysfunction in Washington.